People in the public gallery at a meeting of Kensington and Chelsea Council at Kensington Town Hall in west London. Ben Stephens/PA Images. All rights reserved.“Thank you for your stories. Let's get on with the meeting.” – a councillor at an open council meeting of Royal Borough of Kensington and Chelsea council. A lot has been said about the burning of Grenfell Tower as a human rights issue. But the catastrophe is as much about political citizenship, and the meanings of democracy, particularly local democracy, in the UK just now. At a meeting last week, the elected representatives of Kensington and Chelsea council looked at the survivors of the fire – and rolled their eyes. At a meeting last week, the elected representatives of Kensington and Chelsea council looked at the survivors of the fire – and rolled their eyes. Last year I wrote about the banality of Brexit, and the audacious thoughtlessness that characterised the UK’s Leave campaign. But to react to the words of people of who had lost their children, spouses, lovers, relatives, friends, pets, possessions – their homes in all senses – as though their words were only so much smoke of predictable, irritating, grievance, is a particularly shocking banality. Those swivelling eyeballs betray a weary contempt not just for the humanity of suffering others, but for the political rights of the members of the community the councillors represent. The councillors were not just being rude, although the conspicuous bad manners in public debate in the UK over the last year suggests a country that has forgotten how to be civil. It is one thing to give offence out of political passion, but something much more shallow and sticky is at work in our current incivility. Shallow was how Hannah Arendt described modern evil – a contagious, rootless malevolence that murdered not so much out of diabolic conviction as sheer thoughtlessness. You could tell you were in the presence of this kind of evil, she said, because of the words it uses: hollow clichés, often pompous, and self-regarding – and devastatingly detached from reality. These are the words people utter when they don’t care who is listening. It’s a thoughtless language for thoughtless actions. By contrast, the two-in-one of thinking – the dialogue in our heads to which we should be listening – Arendt said, was a way of being in the world: judging it, holding ourselves, and one other, to account. "Children went to bed and woke up in ashes." "We are united. We are here to teach you to be united." "I haven't slept in 6 weeks. Your responsibilities are on our shoulders." "You are the leader. You intimidate us daily with the sight of that tower. You call us poor, we are poor in what? Rich in love, culture, heritage." "This village no longer recognises the legitimacy of our estate." "You guys have houses – hear what we have to say." "All public office holders are servants of the public and stewards of public funds… We are not your servants." "The worth of this borough lies in its communities, its cohesion." "You need to be blessed by this community to be in this chair." The key to a missing home is the traditional symbol of the Palestinian Nakba. In that appalling history, the citizenship of some was also assumed while that of others’ was rendered invisible. The language of resistance is resourceful, deep, and creative. These are the words of people for whom it is imperative that language starts to mean things in the world again. If Grenfell has stripped certain words bare of their meaning (‘tragedy’ being one, ‘trust’ another, ‘sympathy’ an unhappy third), the language of resistance is resourceful, deep, and creative. These are the words of people for whom it is imperative that language starts to mean things in the world again. What could be heard in the council chamber last week (for those with ears to listen, and eyes to see) was both the testimony of people who are suffering, and, as importantly, the political speech of people who are thinking, intensely and tirelessly. These ‘stories’ were as much about responsibility and agency, recognition, representation, leadership and accountability, as they were about suffering. The stories were the meeting – or should have been. This was not a demonstration in which legitimate leaders were ‘heckled’, as was implied by much of the UK press, but a demonstration, a manifestation, of what democracy should look like in a place where it was glaringly absent – many residents were locked out of the council chamber, the fire doors bolted against them. An absence of any appreciation for the cruelties of irony is another characteristic of the banality of evil. Arendt thought that speech itself was a kind of action, which is why she defined the ‘right to have rights’ as the right to speech – not necessarily ‘free speech’, but politically meaningful speech. 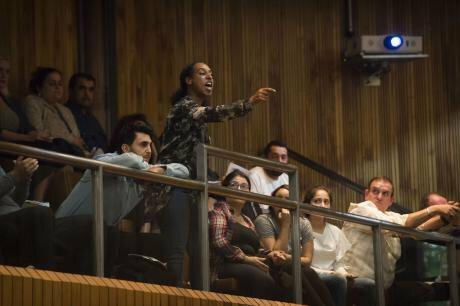 Grenfell’s residents may not have many rights – that much is horribly clear – but in their speech last week, in their actions, leadership and organisation, they were actively claiming their citizenship and, in so doing, giving a lesson in democracy to the rest of us. The etymology of ‘ignorant’ shares a history with the word ‘ignore’: it’s a kind of willing stupidity – a banality. When Daffam called the council ignorant, he was not being rude; he was explaining to them what responsible governance means. The words ‘dignity’ and ‘humanity’ are used a lot in the discourse around Grenfell. They are good words, but they too are lacking meaning. As activist and writer Seraphima Kennedy has pointed out, the citizens of Grenfell don’t need any more pity; it is political and existential recognition that they seek. Thanks to Dawn Foster (@DawnHFoster) Seraphima Kennedy (@seraphimaAM) and Susie Symes (@susiesymes1) whose live-tweeting and reporting on the meeting provoked these reflections.